The semester’s over. Your assignments are in and you've learned your grades for each course. But you've discovered that there's still more you want or need to learn. Perhaps you didn’t understand a key concept you’ll need for your future coursework and research. Maybe you lost some valuable points on a quiz and identified some key areas you still need to work on. Or perhaps at some point during the semester, you discovered there’s a foundational concept you were supposed to pick up as an undergraduate, but your previous coursework didn’t cover the topic. That doesn't mean you're stuck not knowing something! No matter which situation describes your experience, summer’s the perfect time to focus on building your academic knowledge so you’re prepared for the coming semester. Whether you're interested in learning about string theory or developing the ability to apply multivariable calculus to study vector fields, what we know about developing mastery will give you the framework to build the knowledge you’ll need. Someone who doesn’t know enough to recognize what they don’t know. This applies to many undergraduate students just beginning coursework in a new area or graduate students developing an entirely new competency. A learner who knows enough to recognize what they don’t yet know. This level of mastery includes many graduate students reviewing a topic they didn’t understand the first time, or developing a competency similar to one they already have, such as learning the programming language Python when they already know Matlab. When a learner has competence in an area, but reflects on when a skill needs to be used or pauses to decide what the next step would be, they have a conscious competency. Depending on the skill, a graduate student may stop after reaching this level. Now an expert, a person organizes and applies knowledge with little effort. An expert unconsciously recognizes and makes use of patterns, so it’s easier to acquire new knowledge. They quickly recognize new patterns and order new information in ways that are easy to recall and apply in different situations. As the learner moves toward mastery, facts, theories, and information are no longer viewed in isolation. They begin fitting together into a complex picture, where ideas form a web of knowledge that can be recalled and applied to new problems, yielding novel and innovative solutions. Another way of looking at these connections would be to imagine concepts or discrete bits of information as many tiny dots. 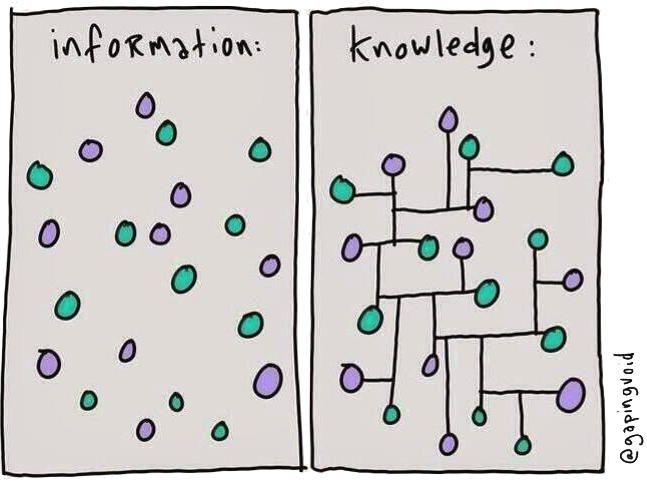 As you learn more and develop skills associated with an area, you begin to see the structure and organization of knowledge in your field; to understand the patterns of information and how facts and concepts are interrelated. So when you can draw on what you know and apply it to new problems, you know you’ve truly mastered a topic. Here’s how this looks in practice: If you’re learning coding, you’d move from memorizing individual tags to seeing how a series of tags can affect the styling of an entire section of text. You’d truly master coding when you can sit down and easily style a page or even learn another new language with facility because you've already mastered a similar language. How you acquire those connections or build that proficiency varies slightly, depending on whether you’re learning something totally new or if you’re building a skill you didn’t master the first time around. Still, the four stages in achieving mastery are the same. The trick is figuring out how to move from one stage to another, from being unaware of your incompetence, where you don’t know what you don’t know, to being conscious of your competence, knowing that you’ve mastered a topic or skill. Use the five steps below to help you focus your energy and efforts as you begin building your new web of knowledge. Remember—these steps are iterative. You’ll repeat them as you explore the topic further, digging deeper and making connections between the areas you’ve studied. Along the way, you’ll develop an awareness of where you’re competent and what you still need to learn. Identify the skill you’d like to develop. Find a good introduction to the topic, such as an undergraduate textbook or an online resource like Khan Academy or Coursera. Make yourself familiar with key terms and concepts and try to understand how they relate to one another. Using this framework, you’ll build on your knowledge. It’s therefore worth putting in the effort early to get a better grasp of the topic. Take notes. If you’re dealing with a number of interrelated concepts, try outlining your notes or sketching a Concept Map. Paraphrase terms in your own words and try to synthesize ideas, rather than simply highlighting the text or writing down direct quotes. Synthesizing an argument or trying to use your own words helps you make connections and develop a more comprehensive and enduring understanding. You’re more likely to remember the relationships; you can draw on this new knowledge as you continue exploring the topic. When you have difficulties seeing how two topics relate (e.g., if two concepts are at odds or if one concept is part of a larger concept), take a step back and assess where you need to focus your attention, or ask a friend or professor for help. Repeat and revisit.You won’t understand all the concepts and all the connections the first time you sit down to read about them. Exposure to ideas from a multitude of perspectives improves your chances of having an idea “click.” Revisit the readings and your notes. When you find you didn’t grasp a reading the first time around, take a step back. Ask yourself if there’s new terminology you're getting stuck on, or if you need to approach the topic from a different angle. Slowly widen your scope.To find additional resources on your topic, start with the introduction to your topic. Look at the resources the textbook cites, or, if you started with an online introduction, find out who’s the expert in the area. Then find what they wrote. As you read deeper and for greater understanding, continue adding to your notes. Over time, you’ll find that you have a better understanding of the concept. Test yourself and reflect on what you’ve learned. To check for proficiency and move towards mastery, regularly go back and test yourself—see if you can define key terms and show how they fit together without using your notes. If you can’t, you’ve made yourself aware of what you don’t yet know. Use this information to refocus your efforts. Perhaps you’re working on developing an ability, like deriving equations. After reading about derivatives (i.e., where they’re used, key principles and defining characteristics of derivatives, and how they work), begin by working simple examples from a textbook without looking at the solution. Then check your work against what the author outlines. After working a few simpler questions, try more complex equations. Resist the urge to “plug and chug”—sticking with one approach and simply plugging in numbers. Start each new problem by asking yourself if you need to use a particular approach and, if so, which one. By challenging yourself and working analytically, you’re making those deep, enduring connections that help you truly master the skill set. Before long, you’ll find yourself developing competencies and getting better at learning and mastering new topics. When the fall semester rolls around, you’ll be ready to tackle new coursework or continue making progress on your research. Having new insight into how to develop mastery can help you as you move on to new areas of knowledge—or even when you’re teaching and helping students move through their own stages of mastery.